The edition I read was translated by Donald Rayfield and John Farndon. On New Years Eve 1938, the writer Abdulla Qodiriy is taken from his home by Soviet soldiers and thrown into prison. To distract himself from the physical and mental torture he experiences, he attempts to mentally reconstruct the novel he was working on. A novel about Oxyon, a Uzbek poet and queen who was married to three khans in succession, and lived how Abdulla now does, in constant fear of execution. As Abdulla gets to know his cellmates, he discovers more about the political intrigue that happened during Oxyon’s time, about the English and Russian spies, and how it has similarities with his own experiences. As Adulla identifies with Oxyon more and more, the line between fiction and reality, the past and present blurs, and his inability to trust his own mind could be his downfall. This was a very interesting book. It’s a difficult book to describe as it’s a story within a story. There’s Abdulla’s life in jail, the fellow prisoners he meets, some of which he knew from life outside prison, and others he had just met. There’s the soldiers and interrogators that make his life hell, and he’s on a constant knife-edge, not knowing who he can trust or why he’s been imprisoned. Then there’s the historical story of Oxyon, her different husbands, her time as a part of a harem and her poetry. This story takes place in the 1800’s and as it progresses you can see how events then can be compared to life in 1930s Uzbekistan. 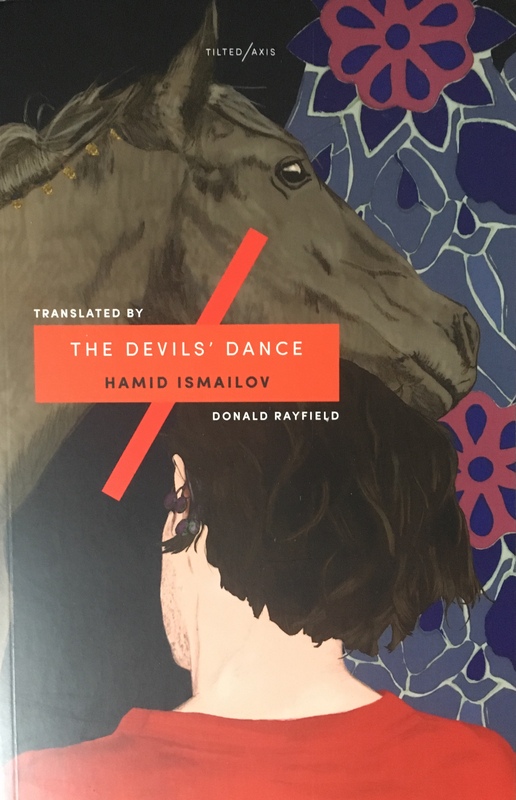 As I read The Devils’ Dance I figured out that Oxyon’s story and the different characters mentioned in that part, were real historical figures, though some of what was written may have been fictionalised. However, I didn’t realise until to the Translators Afterword, that Abdulla Qodiriy was a real person too. It’s documentary fiction, imagining what his experience in jail was like and how he coped. Learning this gave The Devils’ Dance a new meaning in my mind. It made it more sad and made me understand Abdulla and his actions more. The Devils’ Dance was a bit hard to comprehend at times. As the story progresses, the jumps between the present (Abdulla in jail) and the past (spies, khans and poet Queens) became less clear. To begin with, the shifts between time and story were obvious due to the formatting of the book, but as Abdulla gets more and more lost inside his own head, these stories start to overlap. Also, as I have no knowledge of the khans, queens and political turmoil historically present in Uzbekistan and the surrounding area, it was new to me and it was sometimes hard to follow these historical figures and their actions. That being said, I enjoyed how The Devils’ Dance showed me a part of the worlds history that I knew nothing about. The different people and how they interact was fascinating. Clearly a lot of thought and research had gone into this book as you follow Oxyon’s life and the traumas she faces. The Devils’ Dance is well written. Not only is there the text but there’s a lot of poetry in it too. This poetry is from historical poets like Cho’lpon and queens like Oxyon and Nodira. The poetry adds another level of meaning to the book as characters, both with Abdulla in jail and with Oxyon in a palace, express themselves through poetry. The Devils’ Dance is an interesting read. It’s tough to get through sometimes, because of the brutality Abdulla faces and how it merges two stories separated by 100 years together, but the language used in it is often beautiful. It’s a fictional take on real historical events, but with a basis in research as so many historians and writers are mentioned by Abdulla and others, each looking at evidence and having a different idea as to what truly happened. 4/5.